Send Diwali greetings with this lovely gift of Exclusive Assortment of Diwali Hamper to make someone’s day extra special. 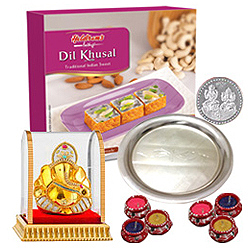 This attractive Diwali Gift Hamper is beautifully arranged with 6 Earthen Diyas, 1 Box of Haldirams Dil Khusal Sweets, 1 Vighnesha Idol, 1 Silver Plated Thali and 1 Laxmi Ganesha Silver Plated Coin. Flowers Delivery Gulbarga, Send sweets Jaisalmer, Wedding Cake Mohali, Diwali Mithai Bhilai, Send Flowers and Gifts to Jaisalmer, Online Shop Kolahpur, Flower to Nadiad, New Year Flowers Moga , Fresh Fruits Vashi, Send Gift Goa, Dry Fruits to Hissar, Birthday Delivery Rajkot, Sending to Hapur, Flower shop Vellore, Karaikal Online Cake Delivery.